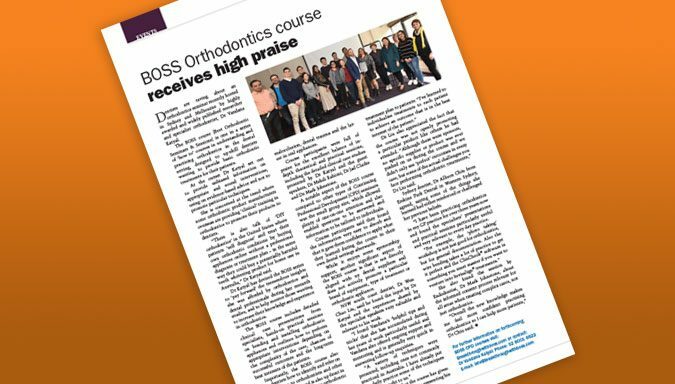 Dentists are raving about an orthodontics seminar recently hosted in Sydney and Melbourne by highly awarded and widely published researcher and specialist orthodontist, Dr Vandana Katyal. The BOSS course (Best Orthodontic Seminars & Sessions) is one in a series of ‘how to’ courses in understanding and practising orthodontics in the dental setting, designed to up-skill dentists wanting to provide basic orthodontic treatments for their patients. Course participants were full of praise for the excellent balance of in depth theoretical and practical sessions, including the detailed clinical case studies presented by Dr Katyal and the guest speakers, Dr Mehdi Rahimi, Dr Jad Clarke and Dr Mark Johnstone. To read the full review click the button below.